As a young person, it can be extremely challenging to deal with issues like acne. Your friends and family might laugh it off as a petty issue but it can be a serious problem. Irrespective of age, we all want to look our best when we face the world but acne, especially on the face, can easily come in the way. Of late, much effort has been directed towards desensitising Indian youth to mental health issues such as anxiety and depression but there is still a long way to go. In this post, we explore what the effects of acne can be on our mental health and how it might aggravate the acne further. We also offer constructive ideas on how you can address the mental and physical issues with reliable medical advice. Mental health issues are often taboo subjects which you might find challenging to talk about openly. As difficult as it might be, it is important to find trustworthy friends, family members or even a support group who will listen to your issues and accept you without judgement. Social Anxiety Disorder (SAD) is a lesser known disorder that commonly affects adolescents and young adults. It can manifest as social anxiety of being judged, negatively evaluated, or being viewed as ugly, stupid or undesirable. While many research papers have been published on this issue in Western countries, limited research has been published on this subject in India. Note that SAD differs from mere shyness or introverted behaviour. The condition is comparatively dire and results in lasting, frequent anxiety. Research has shown that young people who suffer from SAD might have more troubled relationship with their parents and friends. Based on limited research, one of the leading causes of social anxiety is one’s dissatisfaction with their appearance due to issues like acne, pimples, hair loss or weight. Other symptoms of SAD is the fear of public speaking, difficulty in coping with academic pressure and/or tougher relationships with friends or family. Acne is a medically treatable condition but more importantly, know that it affects a lot of people. You are not alone in this journey and you should try not to victimise yourself. Instead, learn more about what the issue is through research and consult with an experienced dermatologist on the issue. Home remedies are rarely helpful for serious cases of acne. Pro Tip: While the symptoms of acne might appear to be similar, there might be different causes fuelling the condition itself. Basically, there are different types of acne. 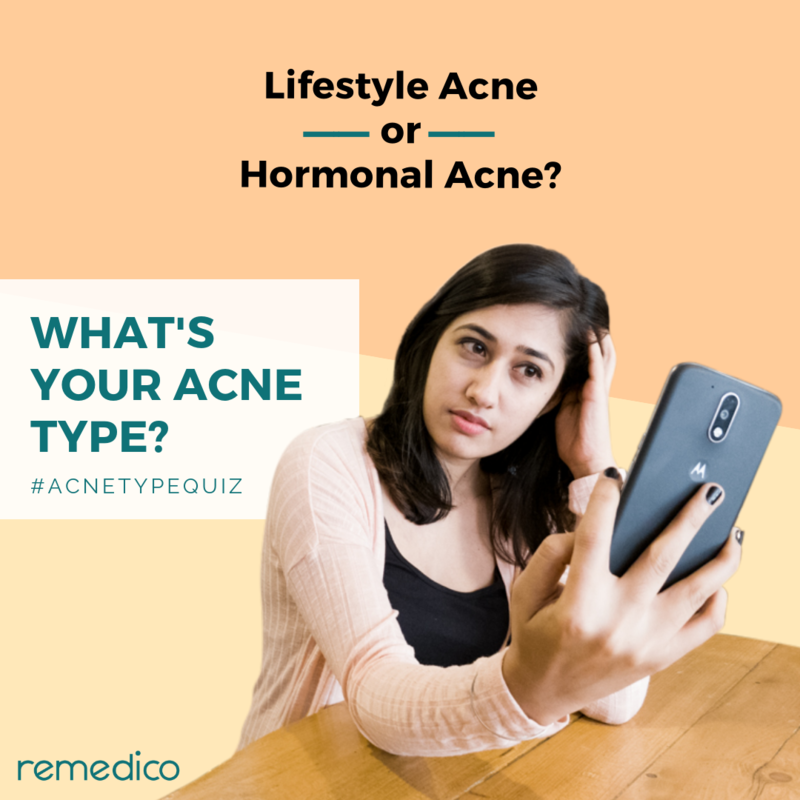 If you are wondering which type of acne you might be suffering from, you can take our short quiz and know for sure. If you have already consulted with a dermatologist and have started your treatment, know that acne takes time to heal. Treat yourself kindly through this recovery period and don’t expect immediate results. Acne can take anywhere from 1-6 months to completely heal, depending on your unique case. Pro tip: Don’t fall prey to creams or ointments that advocate immediate results or radical transformations overnight. Fairness creams, in particular, are your worst enemy and can cause severe side-effects since they may contain harmful components such as steroids, hydroquinone, mercury. Oil-based fairness creams can further tamper with your skin’s natural elasticity reducing its natural immunity to fight with pimple-causing bacteria. There is a unique type of acne which can be induced by poor lifestyle choices. Lifestyle-induced acne is relatively easier to treat as it can be significantly reversed with lifestyle modifications. Factors such as stress, poor dietary habits, sedentary lifestyle, alcohol and smoking can cause and aggravate these type of breakouts. You can address this with simple fixes such as adding protein, omega acids and vitamins to your diet along with staying away from sugary and fried foods can improve your skin. Lifestyle-induced acne, is easier to treat because it does not solely depend on medications - in fact medications are used as a crutch. As for your mental anxiety, if it is an extreme case you should consider speaking with a therapist or find a social support group in your neighbourhood. Remedico is here to help you through this. You can now consult our dermatologist for your acne treatment and also our dietician who can give you advice on your diet, how you handle stress, how you should exercise and other lifestyle changes that can improve your skin.